First published on Loyarburok on 12 October 2010. Tempus Fugit indeed! Twelve years have passed since the publication of the second edition of this popular cases and commentary book on Malaysian and Singapore Constitutional Law in 1997 by two distinguished constitutional law scholars, Kevin Tan and Thio Li-ann. During this decade of intermission, Kevin Tan had been out of full-time teaching but remained an Adjunct Professor to the Faculty of Laws, National University of Singapore. To Malaysians, Kevin Tan is also remembered as the constitutional law expert who was barred on technical grounds by the Malaysian authorities in December last year to speak about the Perak constitutional crisis in a forum organised by Merdeka Review. On the other hand, as aptly described in the preface, Thio Li-ann engaged herself during this period with the “practicalities of constitutional politics” as a Nominated Member of Singapore Parliament from January 2007 to June 2009. Hence, the two of them no longer require any further introduction. This third edition is another piece of scholarly work given that the two authors have almost 40 years of combined experience teaching constitutional law. This edition has 1,391 pages despite the fact that the entire text is reset in two columns. The font used is also slightly larger than the one used in the previous edition. Even though indexing found in previous editions is not available in the current edition, the table of detailed contents in the front pages is sufficient to guide the reader to the relevant subjects. It is interesting to note that the book still comprises the same 20 topics. But chapters on Constitutional Interpretation, Citizenship and Special Powers Against Subversion and Emergency Powers have been moved from Chapters 4, 10 and 14 to Chapters 10, 20 and 4 respectively. According to the preface, the re-order of the chapters is done to reflect the authors’ current thinking on how the subjects should be approached and taught. Further, unlike in the Second Edition where Kevin Tan wrote Chapters 1 to 10 and Thio Li-ann wrote Chapters 11-20, there is no such bifurcation in this edition even though we are told in the preface that Kevin Tan played the role as the lead-editor. However, the distinct style of the authors is still very much discernible. Readers of this edition will also be pleased to note that close to 290 new cases since 1997 are cited, referred to and/or commented on in this edition. Many more pages have been added to chapters respecting fundamental liberties. For example, the chapter on Freedom of Speech, Assembly and Association has been increased from 70 pages to 190 pages whilst the chapter on Freedom of Religion now runs into 148 pages from just 54 pages in the previous edition. This is understandable as over the last decade, many freedom of speech cases have emerged in Singapore especially those involving defamation cases brought against opposition politicians and foreign media. In Malaysia, there are also landmark cases relating to freedom of association such as Sivarasa Rasiah v Badan Peguam Malaysia and Dr. Mohd Nasir bin Hashim v Menteri Dalam Negeri Malaysia. Needless to say, much space has also been given to discuss issues of apostasy and freedom of religion in Malaysia with reference to the case of Lina Joy v Majlis Agama Islam Wilayah & Anor. Of course, the importance of other constitutional landmark cases has not been overlooked such as the role of the Attorney-General in Singapore vide Law Society of Singapore v Tan Guat Neo Phyllis; the constitutionality of death penalty in Singapore vide Nguyen Tuong Van v Public Prosecutor; gender equality in Malaysia vide Beatrice a/p AT Fernandez v Sistem Penerbangan Malaysia & Ors and proprietary and native customary rights of aboriginal peoples such as Kerajaan Negeri Selangor v Sagong bin Tasi & Ors. In addition, just like in the previous two editions, excerpts of new articles of influence have been included in this edition. As a whole, what I most like about this book are those incisive and thought-provoking commentaries, notes and questions which challenge the readers to want to know more deeply about the subject matters. Reasonably priced and published in hard cover, this book which is still used as a standard casebook by law students, is an authoritative and up-to-date compendium of constitutional cases and materials which a legislator, judicial and legal officer, legal practitioner and law academic on both sides of the causeway will find it only too handy to have for undertaking their respective tasks. As it is often said, the constitution is a living document and so sacrosanct that it behoves ordinary citizens to be aware of its contents. For this purpose and as a start, this book is comprehensive enough to equip them with the knowledge of at least what are the basic constitutional values and principles required to be observed by the state's institutions and citizenry. 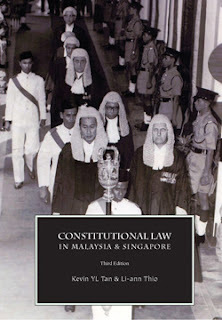 That said, it is unlikely for any further updated edition of this book to be incorporated into a single volume in the light of rapid growth in the constitutional jurisprudence and dissimilarities of Malaysia and Singapore. However, like the authors, I too hope and am confident that readers of this edition will go away imbued with some of the fundamental values of constitutional law elucidated in it, and at the same time become enriched with a knowledge of the letter of the law as well as the wisdom that comes from understanding the spirit of it. I would, therefore, strongly recommend that you procure a copy of it. For more information, please click here. Sounds like an interesting book. Maybe I can find it in Kinokuniya.